Get ready for a trip to Transylvania as The ShockaCon Horror Show devotes almost 80 minutes to the pogo punk power of the The Renfields, who will perform at ShockaCon Saturday night, September 19. This band of monsters discuss their history during a panel hosted by Nick Harrah, and then tear through four great songs at the end of the show. It’s all introduced by Evil Lee Harrah (no relation). You can listen to The ShockaCon Horror Show in this neat little widget HERE, or at Voices of Appalachia. 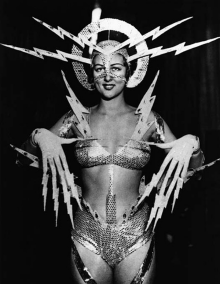 Until September 17, every weeknight, PopCult and at Voices of Appalachia will present The ShockaCon Horror Show, presenting archival material from previous editions of Charleston’s premiere Horror, Science Fiction and Fantasy convention. We hit the homestretch Monday with a show featuring Dr. Who: Regenerated. It’s an unnumbered and random week of short items in the PopCulteer this week, and we are trying out a new Mini-Podcast format for STUFF TO DO, just scroll on down the post. 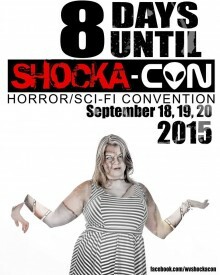 The Halloween Season in Charleston has its unofficial start next weekend with the arrival of ShockaCon 4 at The Beni Kedem Shrine Center on Quarrier Street, near the Charleston Civic Center. As you may have noticed, if you’ve been paying attention, PopCult and Voices of Appalachia have teamed up to bring you an event podcast, The ShockaCon Horror Show, hosted by Lee Harrah, which will run every weeknight up until ShockaCon kicks off. Usually the show debuts at 9 PM, but tonight’s special edition starring The Renfields, will turn up around 5 PM, so that you can listen to more than an hour of the history and music of Transylvania’s kings of Horror-Punk before you head out for the evening. The ShockaCon Horror Show will then return Monday at 9 PM. 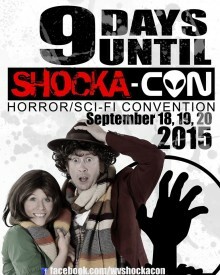 We will tell you more about ShockaCon every day next week. Believe it or not, someone is actually trying to raise money to make a sequel to Manos: The Hands of Fate, the movie so bad that, thanks to the crew at MST3K, it has toppled Plan 9 From Outer Space as the worst movie ever made. Jackey Raye Neyman Jones,who played “Debbie” in this 1966 abomination, is raising money to fund Manos Returns, which will answer all of the burning questions left over from the original film, which made hardly any sense. The T shirt is pretty sharp-looking, and the movie can’t help but be hilarious on some level, at least. If you’re interested, and want a T shirt before it winds up on RFC, check out the Manos Returns website. 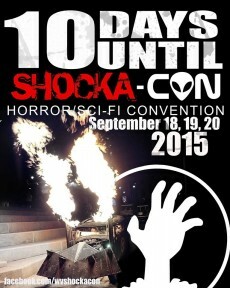 The ShockaCon Horror Show Goes Long and SCORES! Tonight The ShockaCon Horror Show goes big as Lee Harrah hosts a special one-hour-fifteen-minute episode with with extra-long excerpts of the Razor Sharp Productions panel and the infamous Fred Williamson/Jennifer Lynn Warren showdown, plus we conclude Melanie Larch’s panel on surviving the Zombie Apocalypse. You can listen to The ShockaCon Horror Show right on this here widget HERE or at Voices Of Appalachia. Until September 17, every weeknight by 9 PM, PopCult and at Voices of Appalachia will present The ShockaCon Horror Show, presenting archival material from previous editions of Charleston’s premiere Horror, Science Fiction and Fantasy convention. Tomorrow night we hit you right in the face with another bonus-length episode devoted entirely to The Renfields, who will perform Saturday night at ShockaCon. Tonight Lee Harrah hosts a special one-hour ShockaCon Horror Show with extra-long excerpts of the Razor Sharp Productions panel and the Evolution of the Zombie panel, plus music from The Big Bad, who will also perform at ShockaCon this year and host the ShockaCon Aftershock Party at The Blue Parrot. You can listen to The ShockaCon Horror Show in this little widget HERE, or at Voices of Appalachia. Until September 17, every weeknight by 9 PM, PopCult and at Voices of Appalachia will present The ShockaCon Horror Show, presenting archival material from previous editions of Charleston’s premiere Horror, Science Fiction and Fantasy convention. Back in May I wrote about the special 50th Anniversary Johnny West Action Figure. 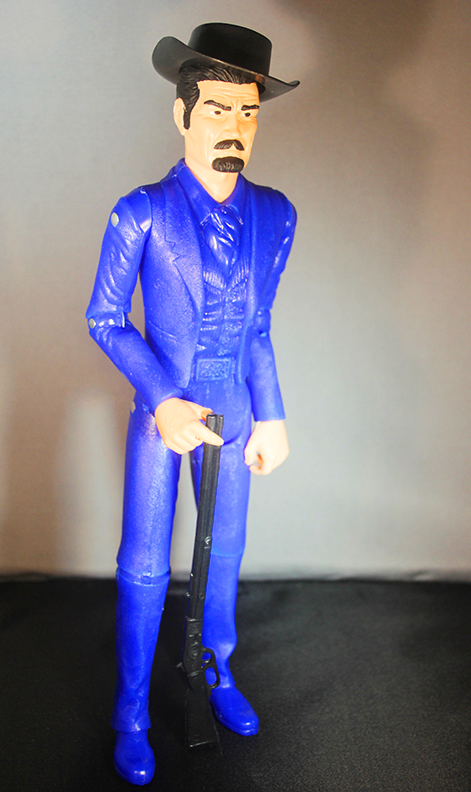 This was a limited run of 200 figures made using the original molds, produced with virgin vinyl and in new colors. It was an impressive set, one made all the more impressive because it was a project that began as a grass-roots idea kicked around on the Marx Action Figure Collectors Facebook page. A collaboration between Jean Zabre, whose family owns the molds, which are now in Mexico; James Wozniak, the chief importer of Zabre’s products in the United States, Scott Stewart, an expert and retailer in the hobby and Terri Coop, who owns the Johnny West and Marx trademarks, the Johnny West boxed set was such a hit that all of the parties decided to continue the Johnny West 50th Anniversary celebration with a new figure, Sam Cobra. 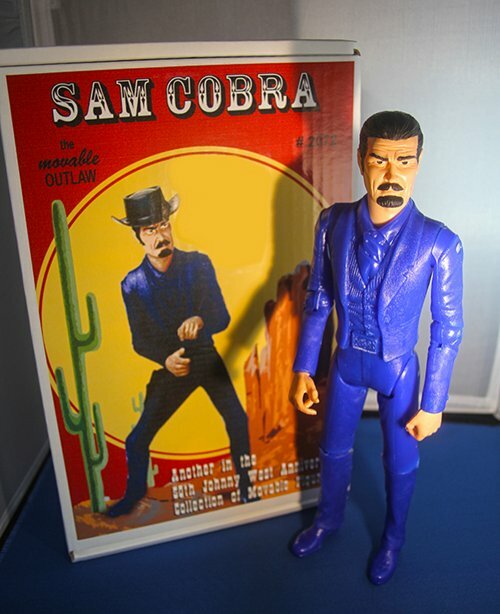 Throughout this post you will see photos of the new Sam Cobra figure, all of them courtesy of Mark Wolfe, who graciously agreed to do a quick photo shoot on Labor Day. If you want to see these photos larger, just click on the images. Sam Cobra was Marx’s Outlaw, and he came with twenty-five accessories, some of which didn’t seem to make sense at the time. He was released in the early 1970s and was the first new face in the Best of the West line for some time…except that his face wasn’t exactly new. Sam Cobra shared his head with Sir Stuart, the Silver Knight from the Marx 12″ Noble Knights line. Sam has an interesting back story, and it has a lot to do with the color chosen for his body in this new Anniversary edition. Tonight’s edition of The ShockaCon Horror Show, hosted by Evil Lee Harrah brings you excerpts from last year’s panels on The History of Monster Toys, Zombie Prep with Melanie Larch and music from The Big Bad. You can hear the show just by clicking on this little widget HERE, or by visiting Voices of Appalachia. Until September 17, every weeknight at 9 PM, right here in PopCult and at Voices of Appalachia, you can hear The ShockaCon Horror Show, presenting archival material from previous editions of Charleston’s premiere Horror, Science Fiction and Fantasy convention. PopCult and Voices of Appalachia are teaming up to bring you a different tytpe of podcast. 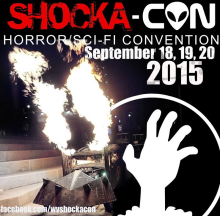 The ShockaCon Horror Show is an event podcast–every weeknight at 9 PM until September 17 we will post a new episode of this show, all to whet your appetite for ShockaCon 2015, which happens September 18, 19 and 20 at the Beni Kedem Shrine Center in Charleston. The ShockaCon Horror Show is a collection of interviews, panel discussions and performances from the archives of ShockaCon, presented by your host, Lee Harrah. Some episodes will be 30 minutes, while others will stretch out to a full hour. Tonight you can listen to pilot episode of The ShockaCon Horror Show, in which Lee introduces interview segments with Fred Williamson and Jennifer Lynn Warren (from American Horror Story) and a dramatic reading by Vernon Wells with Jon Carl Buechler, plus live music from The Renfields, right here in this widget HERE, or over at Voices of Appalachia. We are less than two weeks away from ShockaCon 2015, and in honor of that this week’s RFC MINI SHOW features The Renfields, Transylvania’s hottest punk band, who will be performing at ShockaCon on Saturday night, September 19, at The Beni Kedem Shrine Center. The Renfields were recorded just last week at The Empty Glassm tuning up for their big ShockaCon show. We captured the band doing three tunes, “Burning Revenge,” “Killer Klowns From Outer Space” and “The Invisible Man.” If you haven’t seen The Renfields before, you are in for a real treat. This is one of the most fun bands around. The band performs dressed as different movie monsters. The night we recorded them one of them even dressed up like Bryan Flowers. 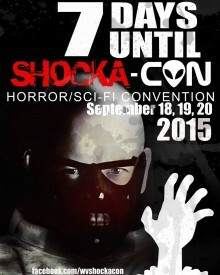 ShockaCon takes place this year at The Beni Keden Shrine Center in Charleston, September 18, 19 and 20. Guests include international acting sensation Bai Ling, the original “Jason,” Ari Lehmen, plus actors from The Walking Dead and American Horror Story and much, much more. Check out their website HERE. PopCult will be bringing you loads of ShockaCon info leading up to the event, with a daily rollout of The ShockaCon Horror Show Podcast, hosted by Lee Harrah, every weeknight at 9 PM, starting tonight. 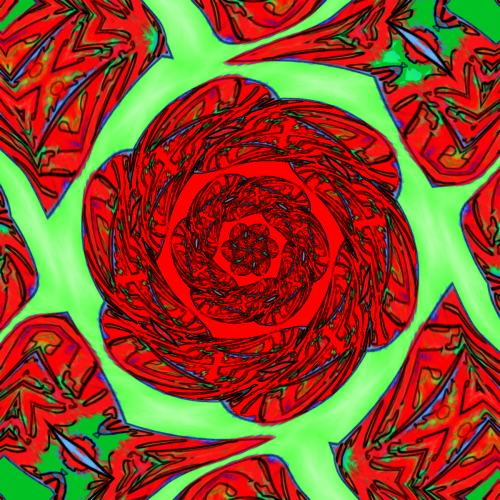 This week we start the art with a digital painting of a rose. To be honest, it started out as a geometrical abstract, but somewhere along the way it turned into a rose. That sort of thing happens sometimes.click to see a bigger version. Today we bring you Austin Susman’s wicked satire of the January, 2014 Freedom Industries chemical spill that tainted the water supply for much of the state. Killer Catfish of the Kanawha tells about an unexpected after-effect of the spill, one that doesn’t come to light until around the time that Freedom Industries CEO, Gary Southern, had his Bentley returned by the court. You may remember that I wore the shirt and named episode 211 of Radio Free Charleston after Austin’s 30-minute epic. We also ran the trailer, and since then the film made its debut on YouTube on September 1. Now we bring it to you here in PopCult. Enjoy…and beware!